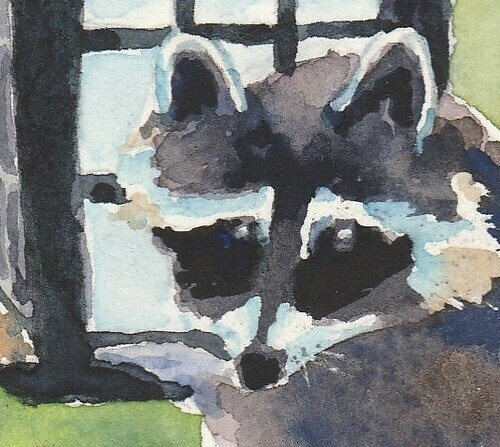 Mr. Bad Raccoon Watercolor – Let's Paint Nature! This is Mr. Bad Raccoon. Mr. Bad Raccoon liked to visit my bird feeder at Christ in the Wilderness promptly at 8pm every night. He was very hungry. He was also very smart. 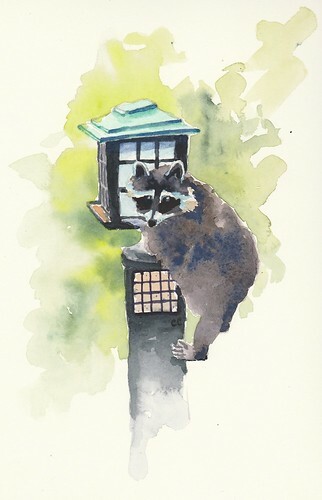 His large body conquered the raccoon baffle on the feeder itself by standing on his hind feet, hugging the baffle, and inching his way to the top where he would lift the lid right off. Once on top, he would either cup his hands grabbing seed and bring it up to his face or he would place his whole head inside the feeder. His determination created a soft spot in my heart and I stopped shewing him away. I reasoned with myself that if he went through all of that hard work, he must be rewarded. So I just watched in amazement. His is kinda cute.